Key skills: ecosystem modelling, spatial modeling, data analysis and visualization, forest growth and yield modeling, workshop facilitation. Don’s work is focused on understanding and solving natural resource management problems in terrestrial and aquatic ecosystems, using skills in mathematical ecology and simulation, statistics and probability, and numerical methods. With over 30 years’ experience in quantitative ecological modeling and analysis, Don works to apply these skills to the development of user-oriented tools that increase understanding of natural systems, strengthening decision-making for natural resource management. He has an ongoing interest in spatial modelling of natural systems and in the development of cross-scale approaches to spatial processes. 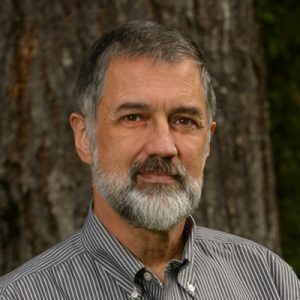 His skills include the development and implementation of numerous simulation models for aquatic and terrestrial ecosystems; comprehensive understanding of a wide range of statistical methods and probability theory to address uncertainty; years of applied experience in theoretical and mathematical ecology and numerical methods, and multivariate visualization. Most recently, he helped create an open source version of the Forest Vegetation Simulator (FVS) model, developing tools that enable the application of this model across multiple platforms. He also participates in the development of the application program interface which allows the FVS model to be embedded in other forest management systems. Don is also an active member of the team developing and applying the Ecological Flows Tool (EFT), a simulation system which evaluates the effects of different water management scenarios on over 30 ecologically sensitive species in the Sacramento River basin. In related work, he is supporting the development and implementation of a novel cloud-based optimization paradigm called “Turn Taking Optimization,” demonstrating ways to flexibly manage the Sacramento River and Delta hydrosystem to meet multiple ecological objectives without sacrificing agricultural and social water needs. Don is a Registered Professional Biologist and holds B.Sc. and M.Sc. degrees in Zoology from the University of British Columbia, with additional graduate studies at Cornell University. As part of the team which developed the Fire and Fuels extension to the FVS model, Don received a Certificate of Appreciation in 2007. This fire management system is in wide use throughout the US. He is also one of the founders of the open-fvs system and serves as a referee for the Ecological Modelling journal.